With bond yields skyrocketing to unsustainable levels, it’s no surprise to see EZ leaders bicker about what should be done to keep the crisis from getting worse. Now they’re debating about whether the ECB should just print more money or if it should still stick to its mandate of keeping inflation in check. If you’ve been following my blog, then you’re a cool cat who probably knows that Italy’s bond yields have risen over 7%, the level that forced Greece, Ireland, and Portugal to ask for bailouts. However, after a few days, it’s not just Italy that’s treading the bailout territory. In its most recently concluded bond auction, Spain paid 6.97% for its 10-year bonds. Not only is it a hairsbreadth away from the 7% mark, it is also the highest rate since the introduction of the euro. Yikes! Sadly, it seems like the mounting pressure from markets isn’t helping European policymakers come to a consensus. The region’s biggest economic superpowers, Germany and France, are at a deadlock on what the ECB’s role should be in the crisis. We’ve seen the two nations argue about plans to stem the crisis before. Now their most recent debate started when French Finance Minister Francois Baroin insisted that the ECB should step up its game. His plan is for the EFSF bailout fund to have a banking license that would allow it to borrow from the ECB. By doing so, there is more money available to insure debt-ridden nations which would consequently boost investor confidence. However, German Chancellor Angela Merkel is against the idea of the ECB printing more money and becoming a lender of last resort. In her defense, Mrs. Merkel says that the move won’t solve the problem. She suggested instead that policymakers should just focus on restoring market confidence by ironing out the details of the EFSF and changing the EU treaty to implement stricter budget controls. Don’t think that ECB policymakers have just been sitting idle as the debates intensify. Just last week, there were rumors that the central bank stepped in the bond markets and bought Italian bonds to keep yields from rising. Now some of you might be saying, “The ECB should just keep on buying bonds then. Voila! Problem solved!” Err, unfortunately, that’s easier said than done young Padawan. You see, the ECB has to sterilize its bond purchases. In geek lingo, sterilization is simply the process by which a central bank mitigates the side effects of capital inflow (i.e., inflation). The ECB is able to do so by issuing one-week deposits that require European banks to place cash with the central bank. The total amount of which is then equal to the total money that the ECB spent in buying bonds. In the process, the money supply is kept constant, and doesn’t fuel inflation. Of course, the obvious downside to this is that its effect on bond yields is temporary. On the other hand, Monsieur Baroin’s idea which would require the ECB to print more money will have a more lasting effect on the bond markets. But the problem is, according to ECB head honcho Mario Draghi, the move is outside of the bank’s responsibility and against its mandate of maintaining price stability. Perhaps the ECB’s bond buying would be enough if credit rating agencies weren’t so excited about issuing downgrades. Don’t get me wrong, I am also a fan of Mrs. Merkel’s mantra that prevention is better than cure. However, with naysayers already warning that a credit downgrade could be around the corner, how long do you think will the ECB’s bond buying program be able to keep bond yields from rising until confidence is restored by promises of tougher austerity measures? I don’t know about you, but I’m not holding my breath for that. 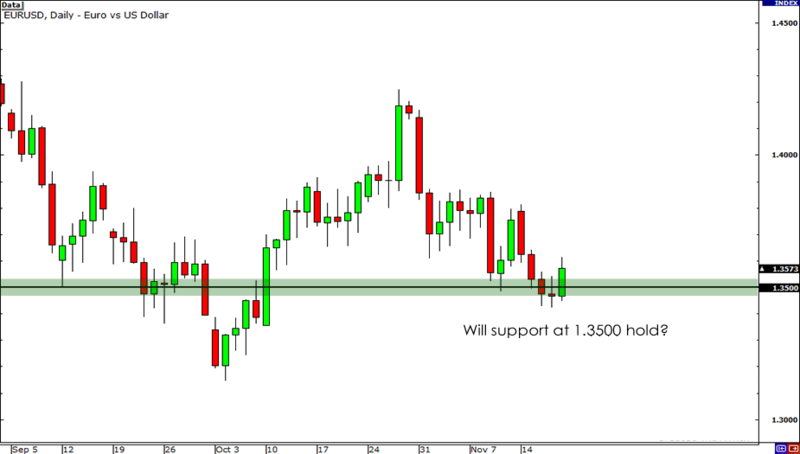 Neither am I keeping my hopes up that support at 1.3500 on EUR/USD will hold. But then again, that’s just me. Germany or France: Whose side are you on?